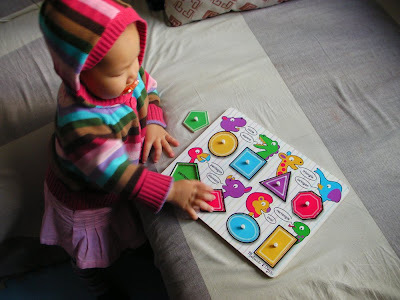 Natalie has learned to solve a shapes and colors puzzle almost all by herself! She is amazing and so smart. See her in Video 171 of Natalie puzzling it out. She makes little "eh-oh-eh-oh" noises when trying to fit each piece into its place. wow! natalie is so smart!! impressive! She's getting good!!! Good thing we're recycling stuff!! LOL - i have other puzzles at home, but maybe wait until she is older!